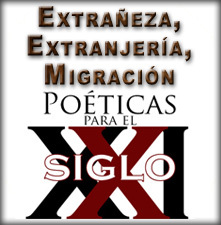 “Extrañeza, Extranjería, Migración / Estrangement, Foreignness, Migration,” a graduate seminar in the Department of Spanish and Portuguese that convened between Sept. 25 and Nov. 9, recently coordinated with the department’s annual poetry event “Poéticas para el Siglo XXI / Poetics for the 21st Century.” The centralizing theme for both the seminar and the event, which took place on Oct. 27 and was free and open to the public, was the ways in which poetic language confronts and incorporates a variety of differences provoked by cultural contact in contemporary Spain. ? Internationally acclaimed poets Concha García, Ana Rossetti, Jenaro Talens, Bahia Awah, Limam Boicha, Clara Janés and Abderramán El Fathi led graduate seminar class discussions during their residence around topics of poetic production and reception in Spain today. ? ? Before the first poet arrived, the students examined recent trends in Spanish poetry and began reading poetry and theoretical works on the seminar topic. The poets themselves have lead class discussions during their residence around poetic production and reception in Spain today. Graduate students have conducted interviews of the poets, which they will publish in a special issue of the department’s graduate student peer-reviewed journal, Pterodáctilo. The symposium culminated in a thrilling three-hour poetry reading, in which Clara Janés and Bahia Awah participated via Skype from Madrid, while Rossetti, Talens, El Fathi, García and Boicha read to a packed house in the Chicano Culture Room. The reading marked the first time that a Moroccan poet (El Fathi) has ever participated in such a forum alongside Western Saharan poets (Awah and Boicha). Two of the invited poets, Limam Boicha and Bahia Awah, are from the Western Sahara, but they now reside in Spain, where they have had a powerful impact on Spanish cultural life. They are founding members of the “Generación de la Amistad” (Friendship Generation) and maintain a blog, “Poemario por un Sáhara Libre” (Poems for a Free Sahara), which streamed the poetry reading live to Western Saharans living in refugee camps in Africa. Abderrahmán El Fathi was educated in Spanish schools in Morocco and completed his PhD in Seville, Spain. He is currently chair of the Department of Hispanic Studies at the University of Tetuán in Morocco. His poetry, written in Spanish about Moroccan migration across the Strait of Gibraltar, earned him the Rafael Alberti Prize for literature in 2000. Clara Janés is a titan of Spanish letters. She has published 30 books of poetry, four novels, monographic books about composers, poets and cultural contact, a handful of plays, memoirs and more than 130 translations. She has received more than 10 prizes for both her literary work and her translations. Concha García has published eleven books of poetry and has been the recipient of several literary prizes, including the prestigious Jaime Gil de Biedma prize for her book Ayer y calles. Jenaro Talens, yet another major poet and important cultural figure in Spain is a professor at both the University of Valencia and the University of Geneva in Switzerland. Talens held a visiting appointment for 10 years at the University of Minnesota, Twin Cities. He is the author of 23 books of poetry, along with scholarly monographs and articles in leading peer-reviewed journals about film, poetry and critical theory. This entry was posted in Literary Events and tagged College of Liberal Arts, Department of Spanish and Portuguese, Jill Robins, Spanish Poetry by Jessica Sinn. Bookmark the permalink.